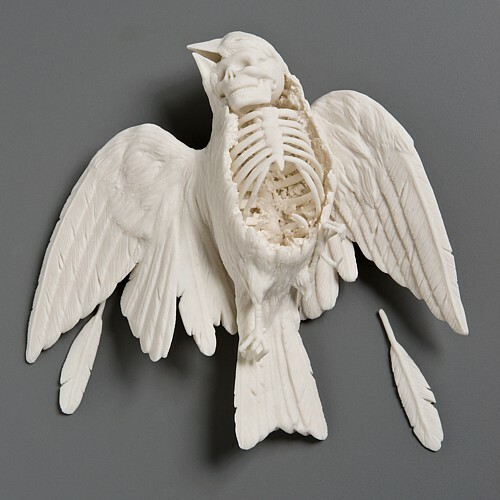 Artist Kate MacDowell represents in her work a perfect reflection of our current day conflict of nature versus mankind. The idea of reincarnation brings an entire new perception to this art form and statement. Kate MacDowell explains in such detail of her work the death of ourselves as mankind within the death of nature and animals. Due to the exclusion of colors and the simplified white mat finish the emotion is heightened and concentrated. The statement is clear: the death and poison to animals is found within the human. My favorite piece is that of the cut open bird and this rabbit as the combination of the skull within the perfect shaped animal body makes you look twice. Wonderful art! I would love to show and tell this at home or in my gallery. MacDowell, Kate. First and Last Breath. 1-2010. 7-2-2014.<http://www.katemacdowell.com/firstandlastbreath.html&gt;. MacDowell, Kate. Casualty. 2-2009. 7-2-2014. <http://www.katemacdowell.com/casualty.html&gt;. MacDowell, Kate. Sparrow. 7-2008. 7-2-2014. <http://www.katemacdowell.com/sparrow.html&gt;.